Differences in a crop plant's genes can help predict how a particular variety will respond to a drier or hotter climate. Geneticist Geoff Morris of Kansas State University sampled the genomes of about 2,000 varieties of sorghum, looking for differences. The genetic material, as well as information about the village where each variety of the cereal grain crop was grown, came from gene banks. Using those different genetic signatures and the location data, Morris and his colleagues were able to determine how each variety adapted to environmental stressors, such as drought and toxins in the soil. They grew test plots of hundreds of varieties in India and Texas, and subjected them to drought conditions. The result showed that the genetic analysis predicted which ones were likely to do well under stress. The findings, collected in a database, will help sorghum breeders in developing countries make better choices about which varieties to plant based on the weather that's forecast for an upcoming growing season. 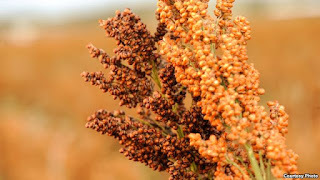 Sorghum is a staple food source for nearly half a billion people, grown in Africa, Asia and some of the world's harshest environments. According to Morris, the researchers hope this approach will help "develop new climate-smart varieties for farmers in the world's toughest crop-growing regions."